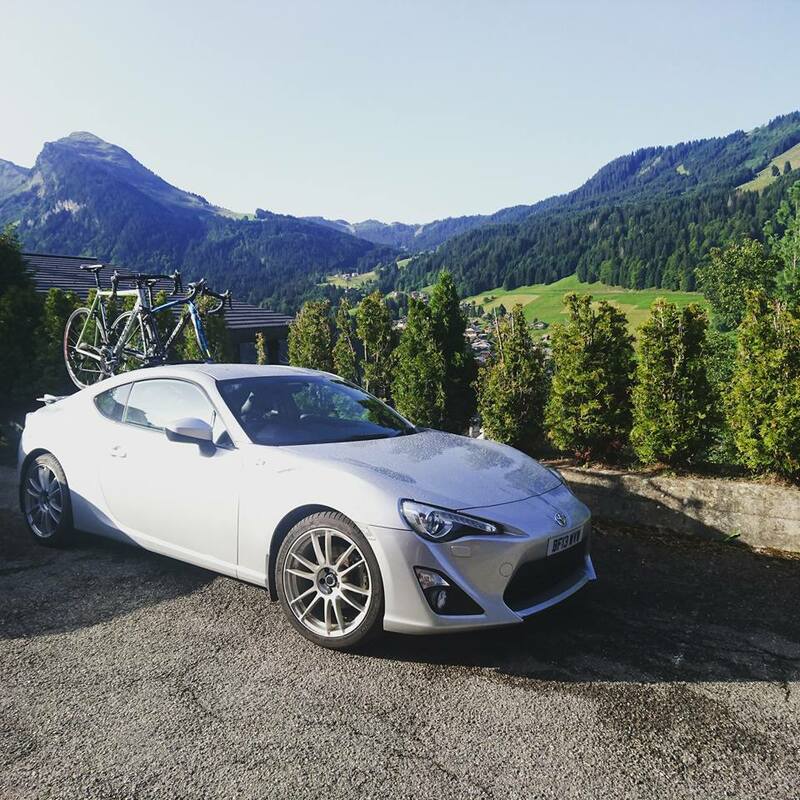 Roadtrip: Morzine to Nurburg via Stelvio Pass – Ride. Write. Repeat. Someone intelligent once advised me to take a two week holiday every single year without fail, and it was good advice. This one was the first in three years where I’ve not done any work whilst away too, so it’s been refreshing plus. The 2017 expedition (an they are always expeditions) was cut into two clear segments: Part 1, a week in Morzine staying in the same place and enjoying the sun. Part 2, road tripping in search of ticks next to bucket list items. For me: climb the Stelvio, for Maurice: take the car round the Nürburgring (I’d say just ‘drive the Nürburgring’ but I later realised he’d already tested the “Green Hell” on a motorbike). The bucket list isn’t, to be clear, a formal list we have actually penned. But I’m starting to think it should be. We travelled to Morzine via ferry to Calais, with a brief overnight stay in Dijon (the mustard that came with the steak was, indeed, better than the expensive sauce). A week requires a chalet. Some people like hotels, I suppose – but a home away from home means you can cook for yourself, when you want; wash your own clothes, and arrive and leave without exchanging awkward pleasantries. We chose Rez d’Arnica – a lovely little ski inspired wooden dream just outside the main town of Morzine. 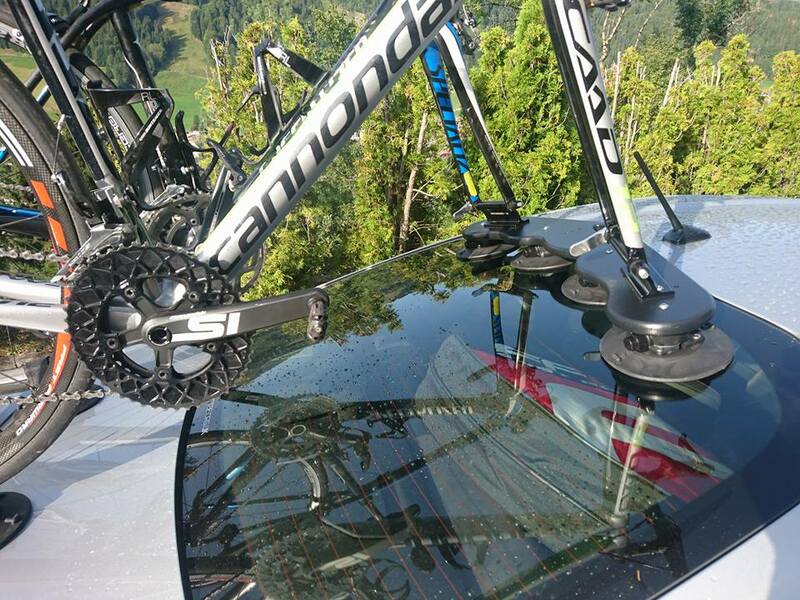 It happened to be located half way up the Col d’Avoriaz which was handy on the day we decided to keep our ride short. 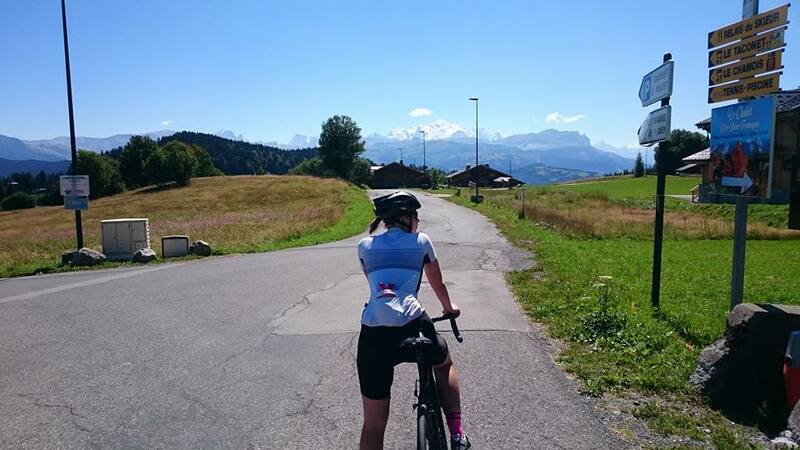 The daily-pocketed Morzine cycling guide referred to the Col du Joux Plane (11km, average 8.5%) as ‘formidable’ – so obviously we checked that one off of day one. Formidable was perhaps an exaggeration – but it was tough. Rendered less so by the tranquility of the surroundings and the way the climb ramped up from a friendly start on quiet roads. The sort that don’t expect enough traffic to warrant a white line. Other notable (there were plenty of little ones I could talk about all day) conquered climbs included the Col de la Ramaz and Avoriaz. 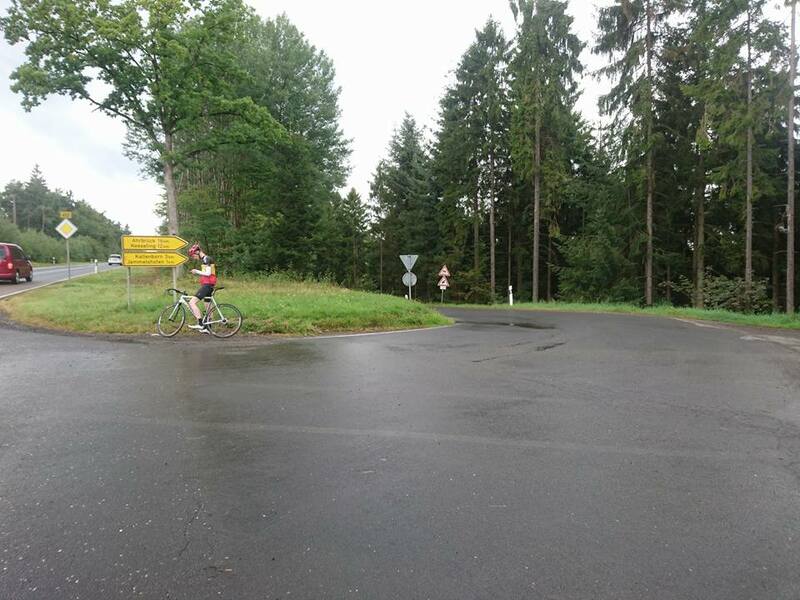 The Col de le Ramaz shouldn’t have been so tough – 14km, 7% (from Mieussy). But it was. Perhaps the heat, perhaps failure to quite adjust to my new gearing (50/34 to 52/36 – yes, still a compact blah blah…). On the plus side you can just make out the peaks of Mont Blanc, wearing an icy cap and a halo of cloud, from the top. And there’s a cafe serving ham and cheese sandwhiches for a few euros (not the expensive one at the top, keep going, down the descent and stop at the place overlooking in the next town..). The Avoriz (14km, 6%) began on our doorstep, so we took it fairly chilled – but it is a little less pitchy than some of the others. The views at the top fall into the ‘extra real’ category, they feel like something out of a film which requires you to wear paper glasses with red and green windows for viewing. We rolled down the other side via the infamous ‘Goat Village’ (really, there are a lot of goats) – the descent is a bit rutted, with ‘fewer than the recommended number of sides’, but pretty. Our ‘less climby’ day (37miles, 5155feet?!) 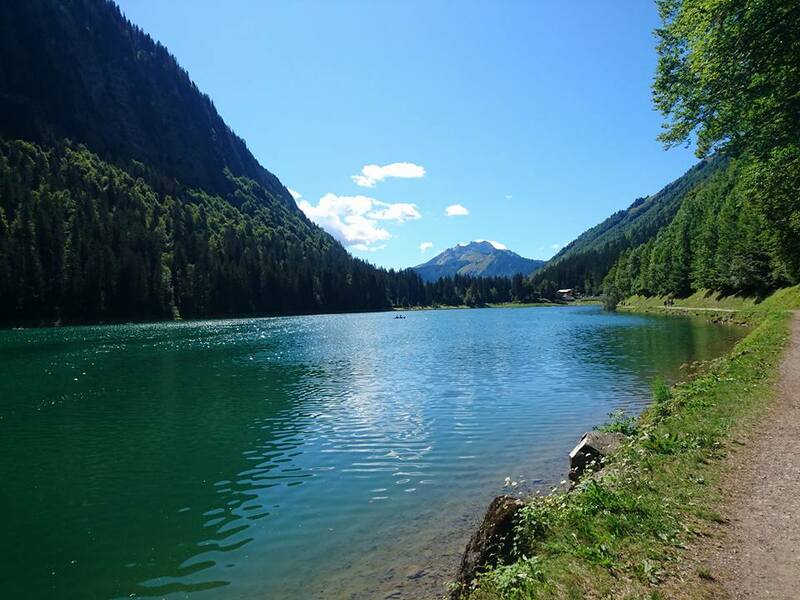 was a loop through the ‘Valley of Abundance’ before checking out the Lac de Montriond. The lake is a treat to be recommended for anyone who enjoys sunbathing, lake swimming, canoeing, SUPing, drinking coffee, drinking beer, dusty pony rides (not in that order…). We returned later for a spot of canoeing, which was pretty cheap and an interesting test of our scrawny bike rider arms. 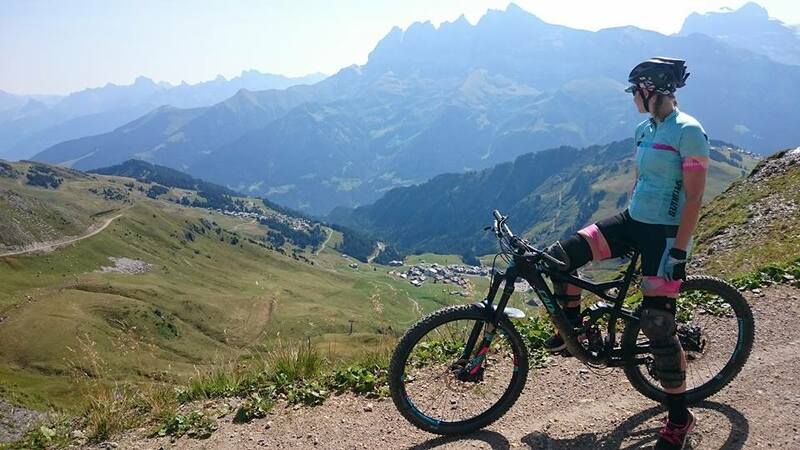 Outside of cycling, there’s a lot to do around Morzine. Highlights for us included seeing the local ice hockey team playing at the rink in town – tickets were pretty cheap and we got a good two hours entertainment out of cheering our chosen sides (mine won). For those who like to hike, there’s lots of that too. Mainly due to rain forecasts, day four (Thurday) was our hiking day. 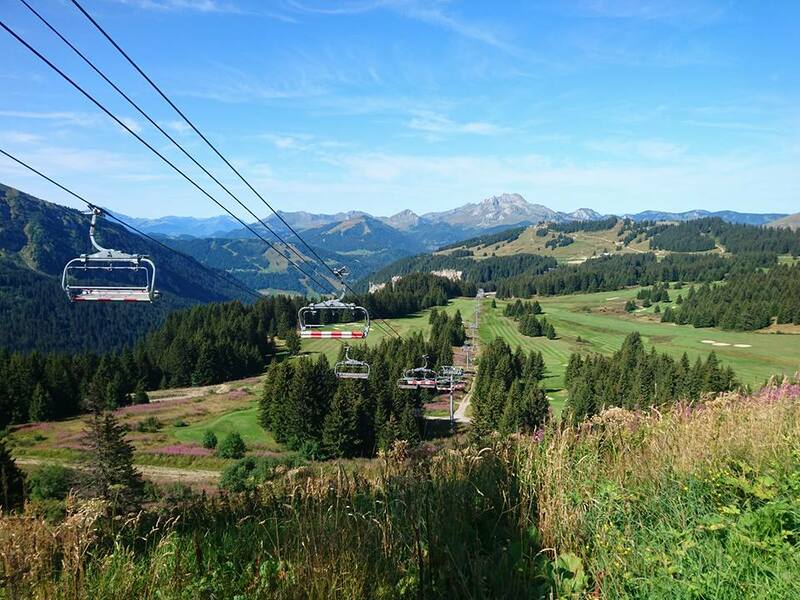 Since summer in Morzine is best known for its mountain bike trails, the ski lifts serve large crowds of baggy shorted, full-face-helmeted riders for 27 euros a day. Walkers can skip the queue and ride all day for 2 euros. So up-up-up we went. Getting a bit off-track meant we were out for a few hours – time enough to 1) discover there’s plenty for walkers to do 2) inspire a desire to try the trails on a bike with knobbly tyres and springy bits. On our final day in Morzine, we broke with tradition and hired some of those springy bikes that people use to go down things they call ‘gnarly’, ‘epic’ and/or ‘awesome’. I’ve ridden at a trail centre once – it did not go well. Morzine being a major European MTB destination meant I was kind of in the deep end, and probably looked like it too. The whole endeavour was pretty expensive – two Cannondale Jekyll bikes + (somewhat excessive but included in price) body padding + two x 27 euro ski passes. But we left the hire centre at 9am and returned at 5.30pm, having ridden into Switzerland and tested some boundaries. Well, I tested some boundaries and probably Maurice’s patience wimping out on blue trials – but he was 100 times more patient than I expected anyone to be ever and it really was an awesome day out. It’s worth noting that the nightlife in Morzine was not banging. The ski season is well known for filled bars and big nights out – but either we were there at a quiet time, didn’t go out drinking late enough, or the bike riders of summer prefer to keep their evenings indoors. More than a week in one place and the Arthurs-Brennan clan will probably begin to get itchy feet. So after seven days we packed up our wares, loaded the bikes onto the Sea Sucker bike rack (excellent, btw – best bike rack we’ve tried so far – holds bikes on via suction pads, applied in minutes and safe at 150+kph on a German Autobahn) and made our way to Bormio. 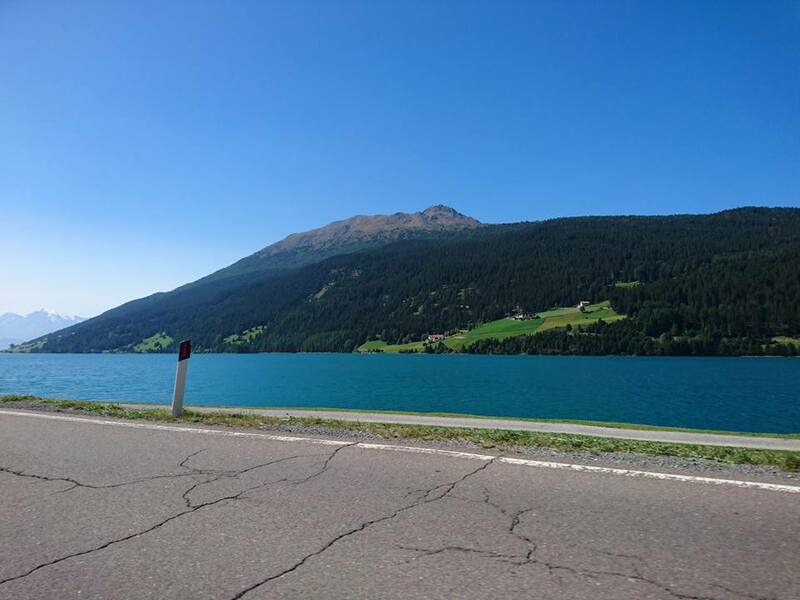 Getting to Bormio meant going via Switzerland – where there’s a 40 euro tax disc you need to have to use the motorways without picking up a fine. We decided to skip it and weave around them – later concluding that it would have been easier to just stump up. 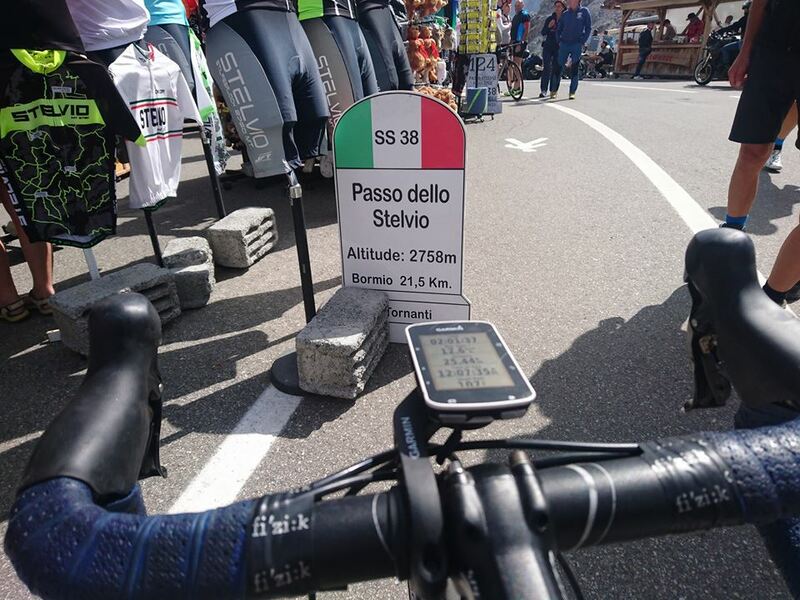 Bormio is home to the Stelvio, the Gavia and the Montirolo climbs. The ascent on my lips was the Stelvio. We stayed at Hotel Vallecetta – a chance ‘night before arrival’ booking that turned out pretty well with ultra friendly staff and a free room upgrade. The funny thing about climbs is that they’re a bit like drugs (or so I’m told). At first, they’re all exciting and steeped in a sense of fear and intrepidation. But once you’ve done a couple – well, it takes more to make a memory. Last year’s memory was Ventoux. This year, the Stelvio (next – Alpe d’Huez?). Saturday we travelled, and Sunday was climbing day. We rode from the Bormio side (21km, 7%) – mainly because that side meant we could stay in Bormio and have easy access to the Gavia, too. The climb actually began without formal announcement. Indeed, the first ‘km to go’ sign was ’20km + 300m’. The first few km were relatively easy, then they settled into a tougher rhythm. At around – 8km or so – there’s a series of tunnels, and when the one solo tunnel with a traffic light made me stop I wasn’t sure if I was relieved or annoyed, neither, probably. At 13km the signs stop for a little while. Usually, I settle into ‘tester’ (time trial metronome) rhythm on a climb. But the Stelvio reaches a height of 2,758 metres, and I backed off at about 10km to go feeling a little mongy. Call it a bit of pseudo-altitude, I reckon. At 14km to go, there’s a beautiful bit of respite, in the shape of a pseudo-flat-bit, which sorted me right out, and through to the finish. 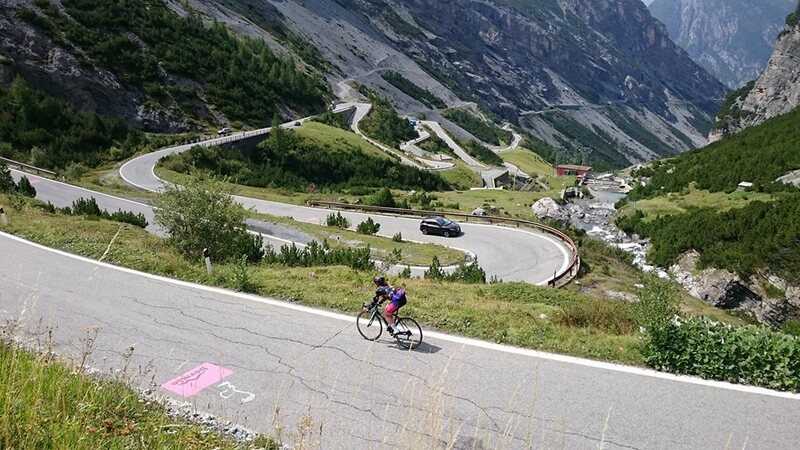 The Stelvio is famous for its hairpins, and the descent might have been a dream were it not for all the motorbikes and car tourists. A bit of a shame – but the last 8km was fun and faster. I’ve been on a little descending journey of late. A trip to Portugal on the N2 Tour with Volta Pro Tours saw me gain tons of confidence. Unfortunately, a later press trip to the Dolomites, and a bike that was 8cm too long for me + euro brakes = crash = loss of all my confidence. The crash was (as far as I can remember) my first caused completely and unequivocally by my own fault – I pulled the wrong brake, which I’ve done before and held upright, but I suppose the bike being 8cm longer than mine probably impacted my ability to right such a wrong. I rode another 40 or so miles after becoming decoupled from the bike and thankfully didn’t cry in front of any male bike journos, but I do now have a big fat scar on my hip and the end result was I’ve been befuddled by my brakes on every descent ever since. The pressure free week in Morzine helped a lot – my confidence was starting to come back, and I’ve found my max speeds creeping up again too. 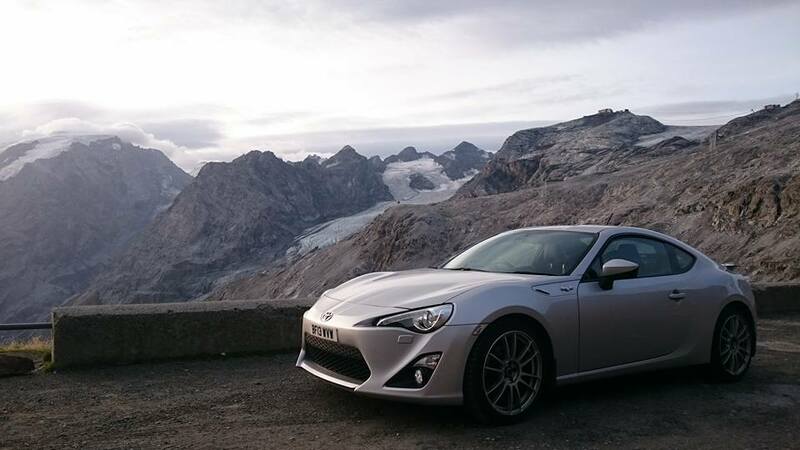 So thankfully, I could enjoy most of the Stelvio. 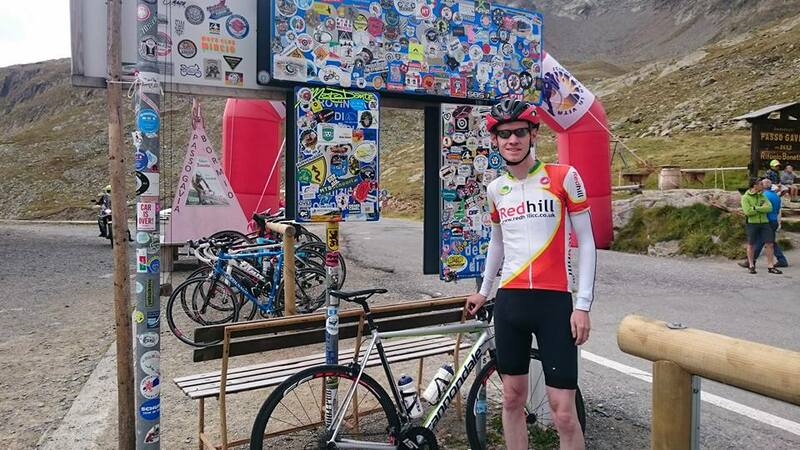 Reaching the bottom of the Stelvio, we hop-skipped into town from lunch and promptly decided we were both too fresh legged for having completed a climb up a major monument (did you read that bit about climbs = drugs?) and that it was a good idea to go over the Gavia, too. 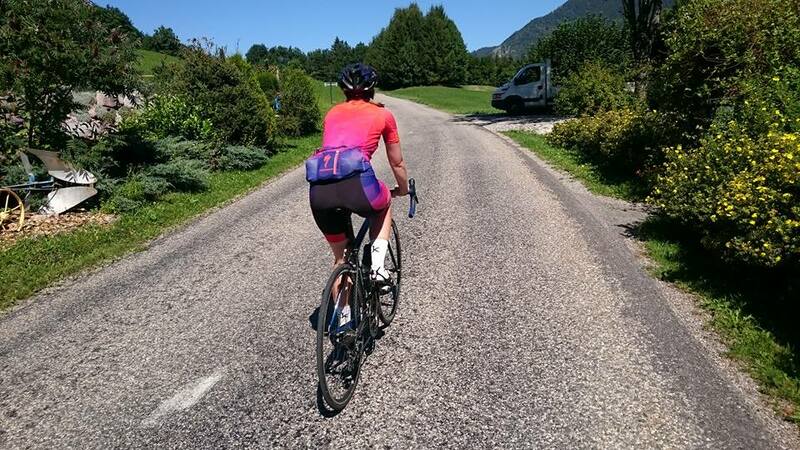 The Gavia is ‘not so tough’ from Bormio – 26km at 5.5%. Sounds easy, right? Yea – nope. Well, not with the swooping upwards hairpins of the Stelvio in your legs, it’s not. The early part and last few km’s are easy, but the middle part is not. The climb disappears into a forest and it all goes a bit hard. There was a hotel about 15km in, pumping out loud music that floated up the mountain for about 2km behind you. I got Dean Martin’s ‘Aint that a Kick in the Head’, which was funny in a not-funny-right-now way. Maurice couldn’t remember his song, but remarked upon the creepyness of a small child on a swing, accompanied by 50s jazz drifting from a hotel located in the mist of a very long climb. Both tripping, it seems, by this point – all be it independently. Rain was in the forecast, and the agreement was we’d turn around if it got bad. It did rain, we didn’t turn round. On a climb, Maurice will always be ahead of me (natural mountain goat) and I was never sure if the rain had yet reached ‘bad’ level – so we both carried on. I wasn’t convinced I was going to get to ride to the very top until I was actually there. But we did it – 63 miles, 13,300ft climbing. Pizza + beer + ice cream followed. The following day was all about making use of Bormio’s thermal baths, a cheeky (not that cheeky) massage, pizza, beer – before checking out to move in to bucket list item two. Took Percy up the Stelvio early (before we could ruin any cyclists descents / get stuck behind camper vans) too. En route we stayed for a night at Bad Liebenzell – but it wasn’t totally remarkable, other than the really friendly German cyclist who rode along with us for about 10 miles or so to help us out with directions on a quick hotel spin. The journey to Nurburg took us through Switzerland again and Austria – the latter of which required an 8 euro car sticker to cover our use of the roads, which were free henceforth – not bad compared to the tolls of France. 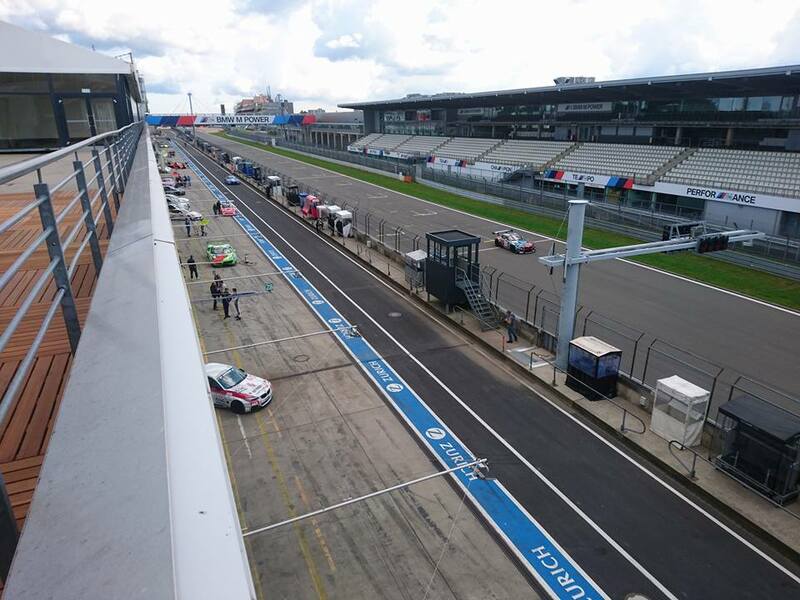 The Nurburgring hosts tourist sessions on Wednesday and Thursday, 5.15pm – 7.30pm. With three nights in one place ahead of us, we’d booked in at Nurburgring Apartment – which honestly I couldn’t fault. More space than our home-at-home, beautifully decorated, with all the essentials provided plus bonus’ like fancy bubble bath and a complimentary beer in the fridge. Wednesday started off a bit wet, and we got a sighting of how not to go crazy with a trackside view of a guy who had just spun his car. 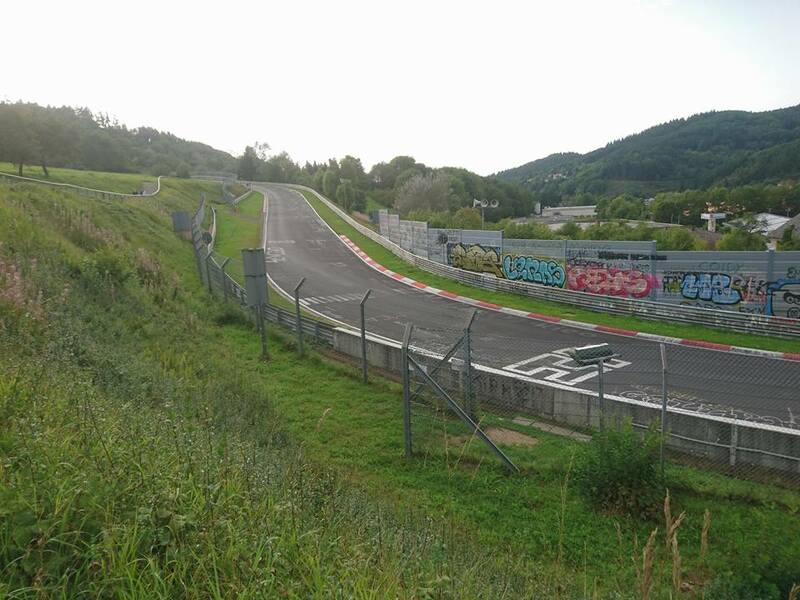 You can’t get track day insurance on the Nurburgring tourist rides, and there are some pretty hefty additional fines for any damage or track closures you may cause. So Maurice wasn’t exactly smashing it to full capacity and I was able to keep my lunch inside my stomach – which is always nice. The apartment was close enough for us to walk into the surrounding forest and watch the rest of the nutters still out there, which we did. Thursday we went for a morning ride, then returned to drive the ring (after a massive afternoon nap). Unfortunately, someone had managed to crash their car within six minutes of the evening session opening – so it was back for dinner and a drink in town for us. A spot of Nurburgring tourism began our final day – and with an endurance event taking place over the weekend there was a lot to see. It was kind of like watching a four-wheeled cycling event set up: all the normal types were there, PRs, press, teams, drivers, snappers. Only I was anonymous and not working and so it was kind of fun drinking coffee and soaking it all in (soaking coffee and drinking it all in?). We resisted the urge to buy expensive wall hangings (99.95 euros for a shaped piece of wood?!) and headed out for a ride. The roads around Nurburg are actually pretty stunning. Very green, very hilly. Kind of a bit like Wales, which is funny because it rained. Warm rain, though; with mist rising in plumes and gallery like forests leaving glimpses of a world beyond. Chapeau. This is my skiing and cycling stomping ground – good to read about it. If you find yourself in the area again, you could try Ramaz from the other (Praz de Lys) side and Colombière and Romme (just the other side of the motorway at Cluses). If you want some tougher stuff, Glieres and Le Mole might fit the bill. I did the Goat Village a couple of years ago – don’t think I’ll bother again! Hi Sureq – thanks – glad you liked it. ‘Completely safe’ – well, we covered 1,900 miles with no problems, cruising at 150kph on some German Autobahns – more review here: http://www.cyclingweekly.com/reviews/bike-locks-racks-storage/mini-bomber-2-bike-rack. Seasucker has tested them to 140mph on a NASCAR track – though obviously it’s not recommended you try that. They’ve also tested them heavily under load. So, they’re pretty damn safe. ‘Completely’ is a tricky one – eg if you attach it poorly (which you’re not likely to do as the indicator shows if it’s attached properly) and drive at 200mph you might find yourself with a problem – but if you intend to use it safely and sensibly then I don’t see you having any issues. Thank you for the answer and sorry for the delay in my response. If you come to Spain, we have something for both of you.